AIM's newest product, its NC258 No-Clean Solder Paste, offers one of the longest pause-to-print windows in the industry and also enhances fine print definitions. Further improving the soldering process, are the NC258's ability to reduce voiding and head-in pillow (reducing rework and rejected board costs) and its superior wetting, which results in bright, smooth, and shiny solder joints. NC258 also offers very low post-process residues, proven to stay crystal clear even at the higher temperatures required for today's lead-free alloys. And, at room temperature, AIM's NC258 viscosity remains stable over long periods of time. 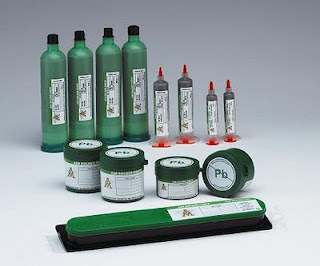 Halogen-free to Oxygen Bomb EN 14582:2007 SW 9056 SW 5050 and halide-free to IPC J-STD-004, NC258 No Clean Solder Paste is best used within nine months when stored at 4°C–12°C (40°F-55°F) or four months at room temperature. QSource.com is now offering AIM's NC258 Lead-Free (NC258-SAC305-45-J5 89-T3) No Clean Solder Paste. For other NC258 products, or to place an order, give us a call at 800-966-6020 (631-563-0600).